Timberland is regulated by federal rules and state forestry commissions, which means that timberland REITs generally face tougher compliance requirements than other sectors within the industry. Even so, the very nature of their assets makes ecofriendly business practices a necessity. Consequently, sustainability platforms have become must-haves across the timberland REIT sector. 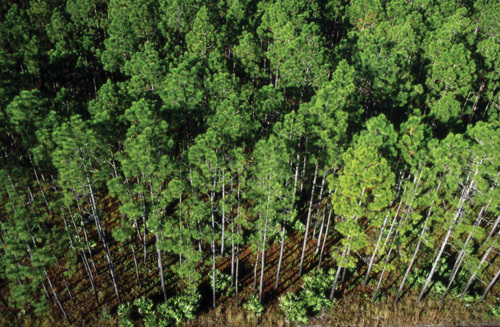 “All the timberland REITs have 100 percent of their land third-party certified as sustainable either by the Sustainable Forestry Initiative (SFI) or the Forest Stewardship Council (FSC),” says Rick Holley, CEO of Plum Creek Timber Co., Inc. (NYSE: PCL). Sustainability audits of timberland REITs review harvests and planting and monitor water quality and endangered species. Timberland REITs also go to great lengths to shrink their environmental footprint. For example, Plum Creek works with conservation groups such as The Nature Conservancy, the Conservation Fund and the Trust for Public Land to raise federal, state and private funds to pay for conservation easements to limit land use to sustainable forestry and to buy land that will be protected from future development. Timber REITs have a solid long-term outlook for reasons beyond robust sustainability programs, though. (Data as of May 29, 2015) Source: FTSE NAREIT U.S. Equity Timber REIT Index. The recession challenged every REIT property sector, but timberland REITs’ exposure to the housing market upped the stakes for them. As much as 50 to 75 percent of timber REIT revenue comes from harvesting trees that are turned into lumber for homebuilding, according to Barag. Resourcefulness and prudent management helped timber REITs manage through the economic downturn, according to Collin Mings, a research analyst in real estate equity research with Raymond James and Assoc. Notably, some REITs just deferred harvesting activity, a built-in benefit of the business. Timberland REITs also developed other businesses, engaged in internal cost-cutting and sold off some of their land assets to survive during the recession. Conservative capital structures kept timber REITs from flooding the market with timberlands for sale, Mings says. Rayonier, Inc. (NYSE: RYN) sold some of its smaller trees to pulp and paper mills. “This gives us near-term cash flow and also prepares the stands for more solid wood growth to be available after the housing market recovers,” says David Nunes, CEO of Rayonier. A byproduct of turning solid trees into lumber is wood chips, the main raw material used for pulp and paper. When production slowed, fewer wood chips were produced and demand went up for young wood that could be substituted for the chips, says Nunes. Sophisticated techniques allow mills to produce engineered wood and laminate products from smaller and narrower pieces of wood with the strength of larger lumber. Mings says that efforts to increase demand for wood products are not a game changer in the near term, but could eventually push lumber prices higher. Th at’s part of the reality of the timber business, according to Nunes. “It will take decades to increase commercial demand for wood, but it’s normal for this industry to do things long term,” he says. It will take decades to increase commercial demand for wood, but it’s normal for this industry to do things long term. Organizations such as WoodWorks, a nonprofit timber industry association, and the Green Building Initiative promote the use of wood in all types of construction, including commercial development. LEED certification standards have already been adjusted, Holley notes. Furthermore, some coal-burning power plants in Europe are being converted to green energy plants that rely on wood pellets instead of coal for fuel. Th at has added another revenue stream for Plum Creek. While the wood pellet business is strongest so far in Europe, Holley anticipates that it could grow in Japan, China and Korea to reduce air pollution caused by burning coal and to provide an alternative power source. Timberland REITs have benefitted from overseas demand for more than just wood pellets. “The demand from China was especially strong because of a boom there in housing construction and the building of a high-speed rail line that needed wood,” Nunes says. Nunes mentions that China’s demand for wood since late 2009 has been the equivalent of 400,000 to 500,000 housing starts in the United States. He expects China to continue to be a large customer, which will impact prices once demand grows in the U.S.
Foreign demand for U.S. timber also comes from India, Vietnam and Korea and will likely increase as developing economies continue to need building products, according to Holley. “The U.S. and Canada are still quantum leaps ahead of the rest of the world as suppliers,” Barag says. Even as timberland REITs have diversified their businesses, there’s no denying the importance of the housing market to their success. Mings notes that although housing starts are well above the low of 500,000 during the recession, they appear likely to lag expectations for 2015. Still, executives in the sector remain optimistic about the future on the demand and supply sides. In spite of the poor first quarter of 2015 in which timber REITs’ total returns declined 3.85 percent, Barag expects improvement for the rest of the year because of pent-up demand. Barag says that lumber prices are still low, so there’s opportunity for growth once housing demand returns. Two different organizations have sprouted up to monitor and certify timber companies’ sustainability practices and give them guidance. As concerns about environmental damage and responsible logging grew in the 1990s, the Sustainable Forestry Initiative (SFI) was started. The SFI forest management standard now covers 250 million acres of forests in the United States and Canada. The SFI program also requires participants to support forestry research efforts. SFI certification standards focus on areas of forest management such as protecting endangered species, prompt reforestation and conserving biodiversity. The Forest Stewardship Council (FSC) says its mission is encouraging “environmentally sound, socially beneficial and economically prosperous management of the world’s forests.” The FSC certifies forests worldwide based on sets of principles and criteria. They include recognizing the rights of indigenous peoples, maintain and enhancing the economic and social health of local communities, and developing and maintaining management plans for operations in forests. As of April 2015, the FSC had certified more than 33 million acres of forests in the United States.